Many listed building owners don’t realise that preserving a building’s architectural heritage means that you can still update it to fit a modern lifestyle. If you’re reading this as an owner of one of the UK’s half a million listed buildings, perhaps you feel the privilege of being able to preserve part of England’s national heritage. Perhaps you don’t! Regardless, the fact that your property is listed is a celebration of the special architectural heritage that we enjoy in the UK, spanning hundreds of years. Contemporary designs for alterations that are sensitive to the listed buildings themselves can produce fantastic results, giving a new lease of life to properties that would otherwise be unsustainable and inconvenient. What are my responsibilities as an owner of a listed building? It is important to take care of your listed property in a way that is sensitive to its character and history. This ensures that historically-interesting buildings are passed down to future generations having been looked after responsibly, and this requires extra consideration, especially when you are seeking to extend, refurbish or alter your property. Is it worth carrying out repair, maintenance or development work on my listed building? Many listed building owners don’t realise that preserving a building’s architectural heritage does mean keeping it up to date and in a condition that allows for a modern lifestyle. Not only is it possible, but it’s sometimes actually advisable to consider carrying out development as well as repair and maintenance work on your listed building. This adds value to the property, and means that it will be maintained in good condition preventing it from damage and deterioration further down the line. You aren’t limited to maintaining only what you’ve been left, either – you can preserve a listed property by carrying out extension and remodelling work on it too, and this can often make it more conducive to modern life, ensuring that it is suited to its inhabitants’ lifestyles. Begore you carry out any work, however, it is important to consult a specialist architect to make sure any alterations you’re planning will gain Listed Building Consent. Through taking a consultative approach and negotiating with your Local Authority, you can make positive changes to your building and help it last for hundreds of years to come. What does making changes to my listed property involve? Listed buildings are protected because of their aesthetics as well as their age and history, so nearly all alterations to listed buildings required Listed Building Consent. Strictly speaking, repairs don’t need consent, although it is worth contacting an architect or Listed Buildings Officer before you start work, just to make sure you are using appropriate materials and techniques. 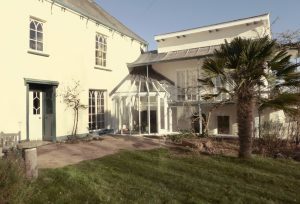 There are many options available to listed building owners seeking advice on gaining planning permission and Listed Building Consent, and we have included some examples of success from previous projects below around Devon, Somerset and the South West. 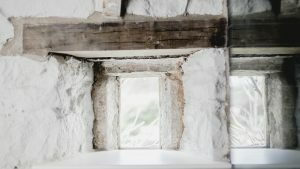 This award winning alteration project, situated on the edge of Dartmoor National Park, brought this 14th Century dwelling back to life. 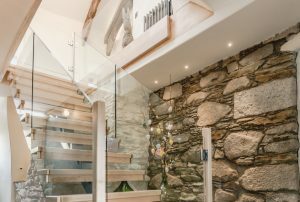 The work encompassed the design of a new contemporary staircase as well as complete internal refurbishment in order to create a beautiful finished home within this medieval building. Traditional materials were used for all the restoration works, and new sheep’s wool and wood-fibre insulation were used in the ceilings. 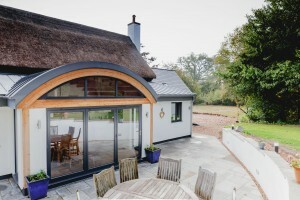 Situated in mid Devon, this extension to the rear of a Grade II Listed cottage in Thorverton replaced some existing outbuildings. The new contemporary extension creates space for an open-plan kitchen/dining room and a series of utility rooms. The use of crisp zinc roofing combined with warm timber structural elements created a contrasting yet respectful form. The application process involved meeting with the Conservation Officer to agree the best approach during the application process. Top tip: be prepared to be flexible with your plans as it is often possible to achieve what you need in different ways. Our work on this property encompassed the design of an extension on the ground floor in order to provide an extra bedroom. It was important that the design blended well with the existing building, whilst also having a light, bright and contemporary feel.